The Recreational Vehicle industry is an ever-changing industry full of new and innovative designs that demand constant attention. Bigfoot Levelers by Quadra have always been ever mindful of this and worked to constantly provide the BEST Leveling Systems available today. 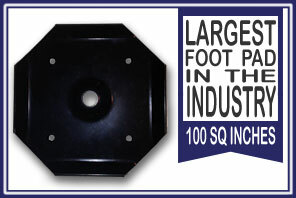 We, here at Bigfoot Leveling, believe so much in this that we have made these levelers our primary business. So walk with us and allow us to show you what we do and what we sell. Bigfoot Levelers are the Industries ONLY Four Pump, Four Point Leveling Systems fitting Class A, Class B+, and Class C Motor homes. On all of these systems, the cylinders are bi-directional so you can power up or down. Add to this the 100 square inch foot pad, and you can feel very assured that you won’t be stuck in the mud when it’s time to move on. Bigfoot Levelers by Quadra grant you the ONLY LIFETIME LIMITED Warranty on the cylinders of these models. Still not enough, you also get 24 hour tech support from ROY TREVINO. The difference between the Four Pump, Four Cylinder systems for the Class A Coaches is lifting capacity per jack. Class B+ and C Motor Homes consumers are demanding better ways to level and stabilize the heavy C Motor Homes sold today. Quadra has dominated Class C’s for over 20 years and vows not to be outdone. All exterior components of these systems are installed under the coaches, not robbing the consumers of valuable space inside storage compartments. The cylinders are straight up and down so you won’t have to be concerned about them ever. Ah, the large 5th Wheel Coaches never cease to surprise in size and features. But even that doesn’t phase Quadra Bigfoot Levelers! Bigfoots are the ONLY time tested fully automatic levelers for 5th Wheel owners today. 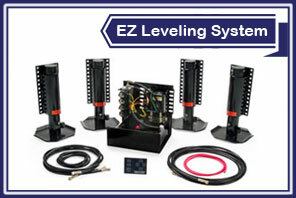 Bigfoot EZ Leveling systems are 4 point single pump, manual control panel are our most economical on the market today. These have a One Year Limited Warranty and have two Options: Wireless or Panel Control. The Racing Industry uses the large Class 8 trucks to pull their trailers or to haul their race cars, but that is NO challenge for Bigfoot! These buyers feel very confident with Bigfoot Levelers they will never be stuck at the track while others move on. These systems require the large 14 3/8” Round Feet for stabilization so please call for direct specifications for YOUR application. To insure more stability from side to side you can order the Square Leg System for the Freightliner and Volvo chassis for a more than sufficient lift and ground clearance. We can offer you customization in cylinders to fit your requirements. Some customers are unaware that for twenty years, Quadra Bigfoot Levelers have be utilized on mobile command centers, ambulances, fire trucks, satellite trucks, etc. Please call us here and we can work with you to insure YOU will get the exact application that will work for you with NO worries of failure. 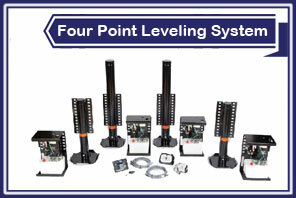 Bigfoot Leveling Systems Of Florida, Inc.